It's that time of week again, the releasing of the Kraken, let us all join in the story telling of our collective Jimmies being rustled. 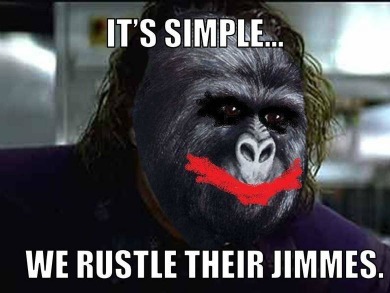 Tell me, what's been driving you baloobas this week, have your Jimmies been rustled? It helps to share... honest. Smoking at doorways ANYWHERE. The smoking area in Mullingar General is right outside the antenatal waiting room. A room full to the balls of pregnant women and smoke wafting in the windows. It makes me want to heave. hehehe, Jen Lawrences Gif is fab. And not just warm loo seats... but the eejits who cant get the loo paper into the loo. instead preferring to leave it all over the floor. ITS A FREEKING WOMENS LOO ... ACT LIKE A FREEKING WOMAN, even if you aren't one, just bloody pretend FFS. The smoking kills me, i think i walked through a cloud leaving blanch at lunch yday!! Ridic!! I hate people blocking doorways full stop grr! I would like to add: TV programmes/Radio programmes/E-mails/Circulars that give us 'advice' on lunches for Back to School. I'm pretty sure I can feck a yoghurt, roll, fruit and cheese into a plastic box without guidelines, cheers. Also, "meat offers for back to school" - ah GREAT!! Because I starved him all summer, obvs.